Monterey County Gives! 2017 kicked off with a robust start of record challenge gifts. The campaign is a philanthropy-inspiring partnership between the Monterey County Weekly, the Community Foundation for Monterey County (CFMC) and the Monterey Peninsula Foundation (MPF). Major supporters help further the cause of lifting nonprofits in this end of year giving campaign. 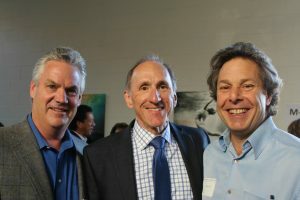 They are the Neumeier Poma Investment Counsel, Cannery Row Company and the David and Lucile Packard Foundation — who, along with several CFMC donor advisors, are providing MCGives! 2017 with an overall Matching Fund of over $425,000. Nonprofits stepped up and raised challenge gifts from key supporters, to encourage giving and engage new donors, raising some $778,000 to kick-start the campaign. Combined, Monterey County Gives! has over $1.1 million in matching and challenge gifts. In their letter to donors and participants in the Monterey County Weekly, Dan Baldwin, CFMC CEO, and Steve John, MPF CEO, invite everyone to be a philanthropist and support the 158 nonprofit participants. Visit www.mcgives.com between November 9 and December 31, 2017 to view the giving opportunities, boost your giving and support the participating nonprofits. Monterey County has its holiday seasons, four weather seasons (sort of), sports seasons and now, Monterey County Gives! season. Starting in the fall, people begin asking about MCGives! : How many agencies? When is the start date? Inquiries by donors who want to commit funds for challenge grants begin even earlier. Hold on, we tell them. It’s not MCGives! season yet; it’s not even the pre-season. But people are eager to get started. While donors can write checks any time to nonprofits of their choice, there are a few reasons MCGives! is so top of mind for donors large and small. One recurring reason is ease. You can go online and make gifts of any size to support the work of the nonprofits most important to you. Survey results after last year’s campaign show donors are cruising the Monterey County Gives! website, often supporting nonprofits for the first time. Another aspect of the ease of MCGives! is that many donors prefer to gift appreciated stock. It can be cumbersome to sort out how many shares should be allocated to which organization—not to mention that many organizations aren’t equipped to accept gifts of stock—so a growing number of donors now drop a lump sum of stock into MCGives! and tell us how to distribute the proceeds. Secondly, donors love the match. While it’s not a one-to-one match, people like knowing 15 percent or so will be added on top of their own gifts. We hear a lot about leverage these days, often as a negative. But this is positive leverage and donors love to wield it, including donors who may have $5 or $10 to give. Further leverage comes from the challenge gifts that donors establish. Knowing your donation will help your favorite nonprofit receive even more support is a great motivator. Third, Monterey County Gives! is democratic. Donations large and small, nonprofits large and small, are investing in the greater good of Monterey County. A big reason behind the growth of MCGives!, both in popularity and funds raised—more than $9 million since 2010—is social media, the great equalizer. The clever utilization of social media has helped smaller nonprofits succeed on the same playing field as the larger ones. Large organizations can reach an even wider audience. It’s good for groups and givers of all sizes. Facebook, Twitter and Instagram reach many potential donors, allowing the cumulative of impact of small gifts to rival that of large ones. If someone donates $10, a thousand others may do the same; $10 might become part of $10,000 going to a nonprofit doing valuable work in the community. It all counts. MCGives! is about assisting nonprofits as they assist others in our community in a variety of ways: Food security. Youth programs. A cleaner environment. Animal welfare. Music. The arts.The depth and breadth of Monterey County’s innovative and vital nonprofits are on full display through this year’s MCGives! guide, highlighting the indispensable work these organizations do, and their Big Ideas for the coming year. Monterey County Gives! is a special project of the Monterey County Weekly Community Fund − a donor advised fund established in 2000 at the Community Foundation for Monterey County.